Everyone needs to stay connected when you travel - let's go over your internet options while you're here in Japan! This article was first published on March 18th, 2015, and has since been updated. As SNS and smart devices have become common in recent years, the internet is practically a daily necessity no matter where you are or what you are doing. A number of services aimed at tourists are available as the number of visitors rises, and will continue to rise, as the 2020 Tokyo Olympics quickly approaches. Here are the three best ways to use the internet in Japan. Each has both advantages and disadvantages, so please use the means which best suits not only your internet usage, but your travel plans and budget as well. ** Please note: The services introduced here are not the only ones available in Japan. MATCHA has simply chosen relatively reasonable services available to visitors from abroad. 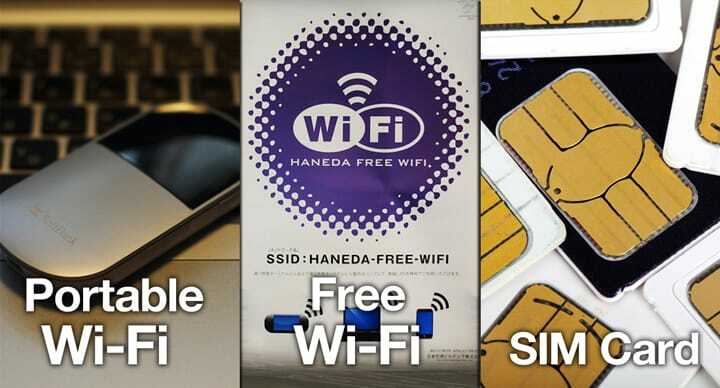 Using a pocket Wi-Fi router is ideal for those who want to use the Internet anywhere in Japan. Not only can you connect several devices such as smartphones, tablets and laptops, but also you can share the Internet connection with others. Many corporations set a fixed charge for the service. Moreover, there is a large amount of storage available, so those who use the Internet a lot do not have to worry about any restrictions or data throttling. Application for Wi-Fi reservations can be made on the website of those companies that provide the routers. If you apply in advance, you may be able to pick-up or drop off your router at airports such as Haneda Airport, Narita Airport, Kansai International Airport, and others. Please refer to each website for details. If you don't have to use the Internet that frequently in Japan, and only want to use it when necessary, using a Free Wi-Fi spot is recommended. Once registered, most of them can be used freely. Particularly in large cities, you can find spots everywhere, so it is convenient to register on these sites when traveling in major cities. As the price is set when you buy the card, these are recommended for those who need light communication by email only. In short, free Wi-Fi is readily available, free of charge but can be slow, Wi-Fi routers are not free but can be used widely for rapid communication, and SIM Cards are relatively cheap but have a storage limit. A Wi-Fi router if you want to see movies and maps. Use free Wi-Fi when in certain, spot-heavy areas. A SIM card for light communication like emails only. Have a great trip, and enjoy being able to use the net in Japan!